Gluten allergy is also known as Gluten intolerance. Gluten is actually a composite of proteins that are found in wheat and related grains like oat, barley, etc. There are about 15% of US people, who are Gluten intolerant. Adults can easily tolerate gluten without any problem but children tend to be highly sensitive to gluten and their bodies can have immediate reaction when exposed to gluten. Gluten allergy generally occurs when the cells in small intestine get damaged making the intestinal wall permeable. This has gluten flowing into the bloodstream. In a gluten intolerance person, when the gluten enters the body, it causes immune system reaction. Skin rashes appear within few hours to 24 hours of gluten intake. These skin rashes are red, itchy, and often peely. Keratosis Pilaris on back of your child’s arm. It is also known as Chicken Skin. Appearance of dark circles under eyes is also one of the common gluten allergy symptoms in child. These dark circles appear as body is trying hard to digest food. 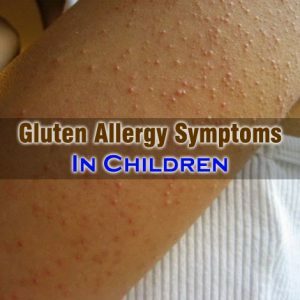 Child with gluten intolerance will get effected with frequent cold and flu. Swelling and pain in joints. Continuous running nose, even after cure of cold and flu. Mood swings, anxiety, depression, and hyperacticity. Water is one of the most important nutrients needed by every cell of the body for functioning in the proper manner. Drinking water in good amount can help the body in feeling more alert and refreshed. It helps a child in coping up with the symptoms of gluten allergy in the most effective manner. For a child experiencing the symptoms of gluten allergy, it is necessary to get extra rest and sleep because it helps a child’s body in repairing itself and in undergoing the natural detoxification procedure. Taking good rest and sleep post gluten exposure can facilitate the healing procedure. Giving digestive enzymes to a child immediately after the consumption of gluten can help in modulating the symptoms of gluten allergy. Digestive enzymes are not good at preventing the damage caused due to gluten but they can be of good help to a child in digesting food better and in lessening gastrointestinal symptoms.